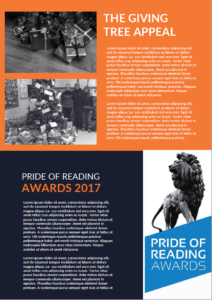 This project was initiated due to a branding module that we undertook during our third year of studying at The University of Reading. 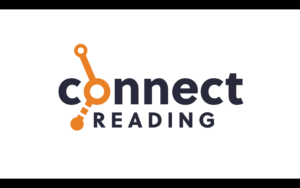 The module consisted of rebranding Connect Reading, which is a Reading based charity. After attending a meeting with Kirsti Wilson, the Managing Director, we created a prototypes and mockups of a range of deliverables and presented our idea for a new brand identity to her. In the meeting we were advised not to use as much of the ‘midnight blue’ colour which we had initially used throughout many of our deliverables due to cost factors. We was aware of that the charity did not have a huge financial budget however this was stressed further to us. 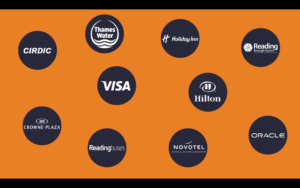 For this reason we agreed that any items which were printed would feature less colour than those that were digital however we would ensure that all still fit the new brand identity. 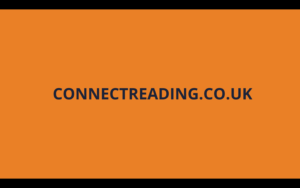 We also agreed that the new promotional video that we would devise, should describe what Connect Reading broadly does rather than focusing on a specific event which we initially had. The timeline requirement for work was discussed and Kirsti expressed that she was very flexible and would allow us to create the deadline and schedule for the project. Overall a second meeting with Kirsti was very beneficial as it allowed us to gain more of a relationship with her as well Tracey Rawlin Church. During the meeting with Kirsti, she asked us if we could present our previous work to the board of directors to ensure that they also were happy with the progress that we had made so far. We agreed that this would be an amazing opportunity as it allowed us to gain a further critique on our designs and would give us an opportunity to pitch them to a well-established and executive board, which we had not previously done before. The board meeting was held at Reading Buses headquarters which meant we were unfamiliar with the IT system that was in place. Therefore, we were advised beforehand that we should put the presentation on a USB and present from the computer that was fitted within the room we would be presenting in. Unfortunately when we arrived this did not go to plan which meant we has to experiment with the projector and use one of our laptops to present. Although this was an issue it was resolved easily and efficiently as we arrived a lot earlier than the scheduled time in case an issue like this happened. This emphasised the importance in always be prepared and arriving early. Overall, the feedback we were given was positive and one of the board members whom is a marketing director even stated that it was one of the best pitches that she had ever experienced. She also gave us more input on our deliverables, particularly the video. She mentioned that we should use language which the audience would speak themselves and not overcomplicate it. In addition, she advised us not to use sound effects as it takes away from the seriousness of the topic. Following on from this we had a team meeting to arrange how we would split the tasks evenly. We agreed that Fay would continue to be our team leader as she had been so far and had already built up good communication with Kirsti during our previous module. From then on we took the feedback we had gained from the board of directors and implemented these into making our final deliverables. Fabio’s tasks within the Real Job project for Connect Reading were to develop and complete the social media post templates, to effectively communicate social media growth strategy to the client during the pitch to the board members and to transfer the design that was created for the annual impact report to a word ready template. The Social media templates packages contain both PNG’s to overlay on top of images as well as the original files to make changes to the existing design. Fabio created a variety of templates which included variations in colour and in the written text present on the overlay. 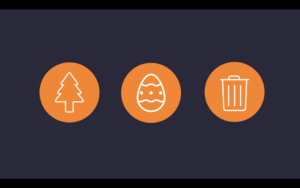 A template with no text was also created to allow the client to add their own text for new events and seasonal greetings when required. We will also be meeting with our client to effectively communicate how to use the templates, how to make changes and how to upload the imagery onto social media. For the social media growth strategies, Fabio could introduce the idea to the board members during the pitch which took place at the Reading Busses head office. Within his section of the pitch, Fabio covered extensive research from studies and personal experience on the most effective way for Connect Reading to gain exposure through social media. Through communicating with the clients directly, allowing them to ask questions highlighted that not all clients will have similar technological experiences and may require more detailed explanation which will be an important factor to remember whenever we have to pitch ideas to clients in the future. The annual impact report was one key deliverables for this project as the client uses the report to sell themselves to potential clients, boasting an impressive network and equally as impressive numbers. Throughout the branding project we created a document in Adobe InDesign to display all the information within the annual impact report in an aesthetically pleasing way, but as we learned throughout the Real Job segment of this project, our client (and our future clients) will not have access to the same software as us, and won’t always want to hire a graphic designer to make a few simple changes to the written copy. 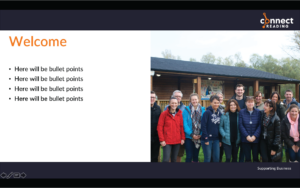 For this reason, Fabio took the initial design and recreated the re-designed annual impact report in Microsoft Word which is our clients preferred software to use. 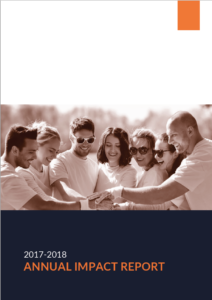 Initially, the annual impact report was designed to be printed but as the project developed it became clear that the report would be sent out via email as a PDF allowing us to freely use colour without worrying about the printing costs. It also meant that Fabio had to make minor changes to the design such as changing sections of the annual impact report which contained columns of text, changing them into one longer column of text to improve the on screen reading experience. Ellie was tasked with creating the new video as she had already made the previous one. 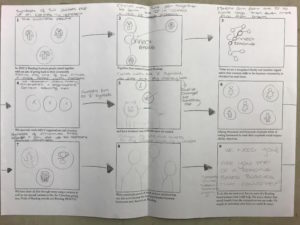 To begin the process she brainstormed the main information that needed to be included and asked Kirsti what aspects of Connect Reading she wanted to be highlighted. From this she created a story board that could be sent to Kirsti to ensure that all the information was correct before devising the video. When speaking with our supervisor, Ellie was made aware that the storyboard would need to be more detailed in order for our client to interpret the information fully. It was agreed that to do this she would give more description on the visuals and give guidance on the timing of the video. Our supervisor also pointed out that we would need to be more conscious of the symbols which we used as some may be seen as offensive or not interpreted in the way which we anticipated. For this reason Ellie developed the story board further. It was critical to get this feedback as it gave us insight that we need to be more aware of the design ideas we are sending to our clients over email vs. how we can describe them face to face. The second design of the storyboard was presented more professionally and clearer for our client to understand. Ellie then presented this to Kirsti, who was extremely impressed by the amount of detail it provided. Together, Kirsti and Ellie agreed on minor changes to the script. Following on from this, Ellie recorded the voiceover of Kirsti so the video would be more personal to Connect Reading and their story. While making the video, Ellie discovered that by placing other brands logos upon the design would clash and would not be visually appealing. For this reason the white versions were used and placed on the iconic blue circles that are used throughout the video. This allowed for the design style to stay consistent throughout. 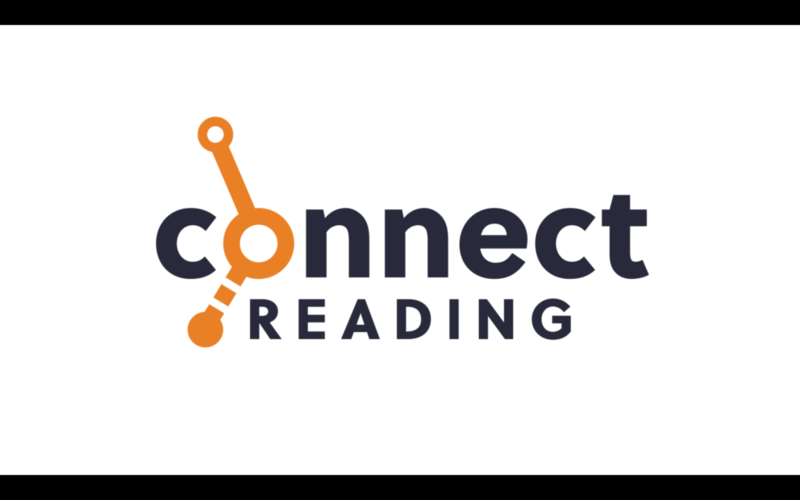 Overall, we believe the video has been structured well to stand out from competitors while telling the story of Connect Reading. It can be used successfully across all social media platforms as well as the website. Besides being project manager, Fay was also tasked with the design and development of the website. It was stressed during the branding project as well as the client and board meetings that the website and annual impact report were integral parts of the organisation and their redesigns were a priority. The objectives we developed in our restated brief aimed to create a website that was current, structured, easy to navigate and easy to edit and maintain from the clients end. Because of the stricter budget of our client, the website had to be developed without the use of typical online web or blog builders and hosting services such as wordpress.com or wix as Connect Reading had already paid for their annual hosting and domain subscription with another server. 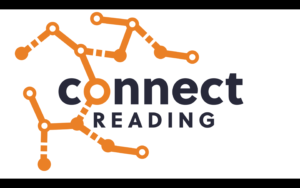 Therefore, Kirsti put Fay in contact with developers from an agency here in Reading that were responsible for hosting the current Connect Reading site to discuss how the website can be developed and deployed. From meeting with a developer from the agency, it was suggested that the best approach to take was a wordpress powered site developed through the wordpress.org software. This website would be self hosted during the developmental stage and then packaged to be deployed by the agency who would host it. Fay had never developed a wordpress site using the software before so it was an opportunity to develop a new skill in learning how to set up a site, databases and SQL servers. The experience was challenging at first, but the technical knowledge gained from it would become an asset in future development of client sites. Throughout the developmental stage, constant meetings with both the client and the developers helped give constructive feedback on both the design and technical aspects of the website. The developers were able to give key advice on realistically implementing some aspects from the design, making us aware of design components that we would have to change to create a more workable and easily maintainable website. The process of consulting and working with front and back end developers also provided an introduction to future experiences in the workplace where a designer would have to collaborate with various skilled individuals on large collaborative projects. Jacks task within the project was to redesign Connect Readings business card with the new branding. The original business cards were very plain and not eye catching. Therefore, the main objective was to ensure the new design would stand out and give a good first impression to anyone viewing it. As already discussed, the midnight blue colour should be used minimally on printed objects. Therefore, Jack looked into different approaches that could reflect the brand without having a high use of colour. Overall we feel that the business card gives a professional reflection of the company and meets the needs of the deliverable. 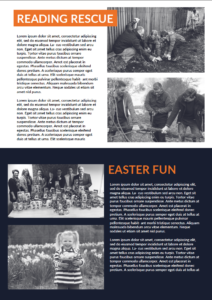 Jack also had the task of creating a new presentation and letterhead templates that Kirsti could easily adapt without the need of any external help. It was arranged in our meeting that these would be created in Powerpoint and Word as these were familiar to Kirsti. She would also be able to export PDF’s easily and continue to save money on printing costs. 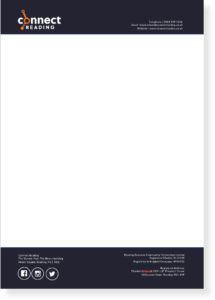 As the letterhead had a main purpose that would be printed, it was essential that the midnight blue was used minimally whereas the Powerpoint could incorporate more as it would always be digital. This reiterated to us, that when designing for our clients we should always consider how these documents will be used. Moreover, we believe that these deliverables would be easily adaptable for Kirsti and therefore meet the objectives and fit the new branding. The original sign up form boasted a corporate aesthetic, therefore, Jack had a task to redesign it with the new brand identity. As Kirsti sends this to clients via email, it was essential that it was easily accessible to all that may want to use it. Therefore, the best document type was a PDF. This would allow businesses, charities and schools to easily fill it out online and send it back. The usability of the document was considered throughout and therefore we undertook user testing to ensure that people who had not seen it before, could easily interpret the information and fill it out. This taught us that we should alway gain insight from others as it gave a new perspective. 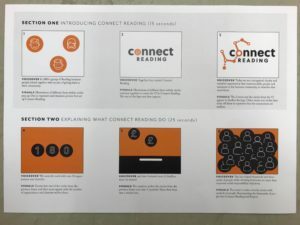 In conclusion, we believe that we have created a vast range of deliverables which reflect Connect Reading’s new brand identity. For each deliverable we considered its primary audience and its use, which influenced the design choices that we made. Therefore, we believe each deliverable meets its objectives. The restrictions we encountered allowed us to each develop new skills. Working with a proactive, organised and helpful client ensured that the job ran as smooth as it possibly could and indicated that making connections such as the one we have developed with Kirsti would be beneficial for our future careers. 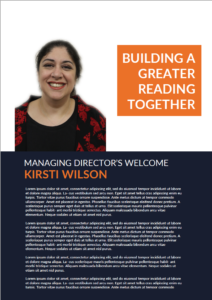 To develop this project further we will continue to liaise with Kirsti and the board or director at Connect Reading and make final adjustments to the deliverables and ensure that the brand is reflected to a professional standard.